The NetUSB-100iX4 is a network-enabled USB Server for connecting USB devices over the 10/100/1000 Mbps Ethernet network running TCP/IP. By adding this USB to Ethernet Server to LAN, you can network-enable the USB device. It breaks the traditional five-meter USB cabling distance limitation. By this implementation, USB devices connected to NetUSB-100iX4 can be made available to remote clients over LAN- without a locally attached host PC. The NetUSB-100iX4 provides a simple and convenient way to extend a USB device over long distances and allows for sharing that USB device with multiple users over Ethernet Network. 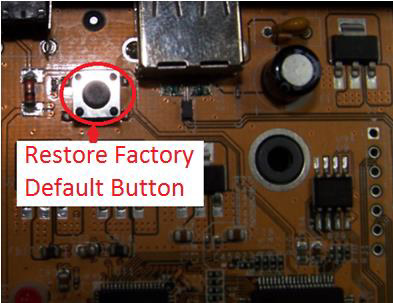 The NetUSB-100iX4 USB server supports a Hardware Factory Default button to restore the default settings (like IP Address). You will need to open up the case. When the NetUSB-100iTX is powered on, press the factory default push button for 5 seconds. It will restore the default settings for the NetUSB-100iX4 USB Server. 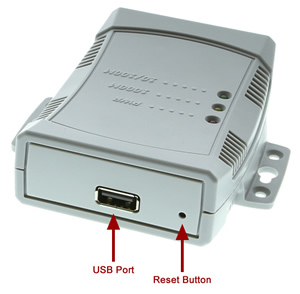 The NetUSB-100iX4 USB server supports Hardware Reset Button to reset the hardware. When the Hardware Reset Button is pressed for a short duration, it will reset the NetUSB-100iX4 USB server system.